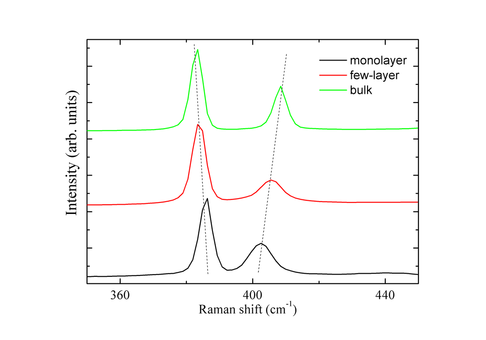 Layer dependent MoS2 Raman spectroscopy. Like graphene, single-layer and few-layer molybdenum disulphide (moly) has distinctive signatures in its Raman spectrum. But first, let’s discuss the Raman spectrum of bulk MoS2. As MoS2 becomes single-layer these two modes evolve with thickness. The in-plane mode upshifts to 386cm-1 and the out-of-plane downshifts to 404cm-1. The difference of these two modes (~18cm-1) can be used as a reliable identification for monolayer MoS2. Remember: We offer single crystals of many layered materials, including MoS2 at our webstore. Visit us now! Anomalous lattice vibrations of single- and few-layer MoS2. Lee et al, ACS Nano, 2011. Thickness-dependent Raman spectroscopy of MoS2 flakes. Phonons in single-layer MoS2 and WS2. Molina-Sanchez et al, Physical Review B, 2011. Theoretical paper discussing evolution of phonon dispersions, focus on the out-of-plane and in-plane mode. It discusses in detail the mechanisms of shifting of the two peaks. From bulk to Monolayer MoS2: Evolution of Raman scattering. Li et al, Advanced Functional Materials, 2012. Multi-wavelength thickness-dependent Raman characterization of MoS2.